While the map maker does not specify, the map likely only includes white colonists in their population figures, thus excluding Slaves and Native Americans. To put those numbers in some perspective, the densest areas in 1775 had slightly over 40 inhabitants per square mile (although density would have been higher in cities), whereas the Boston–Washington Corridor today has a density of over 930 inhabitants per square mile and the entire country has an average density of 91 people per square mile (including Alaska). 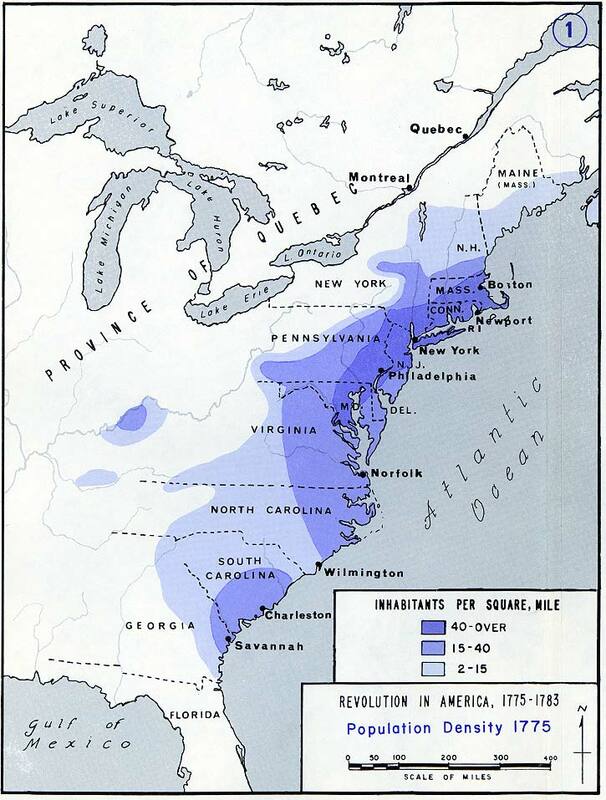 Overall, there were estimated to be only 2.5 million people living in the original thirteen colonies in 1776, although that number should be taken with a grain of salt since the first census did not occur until 1790. As of early 2017, the US population is just shy of 325 million people, a 130X increase over 241 years. I’m disappointed that you’d desseminate this map. Figures for enslaved population are available. Adding them would make the results much more useful. Erasing them from the map is problematic in many ways. I agree with saacnmama, I’m disappointed that this map is used without more than a note saying it only includes whites.